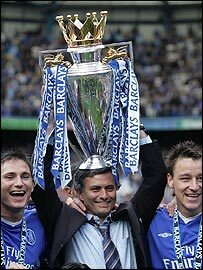 First title in 50 years and richly-deserved for manager Jose Mourinho in his first season in charge. Chelsea's triumph was built on the cornerstones of Petr Cech's brilliant goalkeeping, captain John Terry in defence and Frank Lampard in midfield. Terry and Lampard shared the player of the year honours, with the England defender picking up the PFA award and the midfield man winning the writers' accolade. Mourinho proved tactically adept and, in wingers Arjen Robben and Damien Duff, he had a potent attacking threat when they were fit, despite the lack of a proven goalscorer. Chelsea suffered the disappointment of a second successive Champions League semi-final defeat, this time against Liverpool, but picked up the Carling Cup against Rafael Benitez's side. Mourinho is already setting his sights higher next season - an ominous thought when he is armed with Roman Abramovich's all-powerful chequebook. VERDICT: Worthy champions. Money no object, so expect more of the same. Arsenal's season was derailed when Manchester United ended their 49-game unbeaten run at Old Trafford amid the flying pizzas in October. Took time to get back on track and ended the season in style - but still no back-to-back Highbury titles. Plus points have been the emergence of young talent such as Philippe Senderos, Cesc Fabregas and Robin van Persie but the squad needs more top-quality strength. VERDICT: Most stylish team, but may need more substance next season. Boss Sir Alex Ferguson has presided over a disappointing campaign, with no serious title challenge and an early Champions League exit against AC Milan. Wayne Rooney has proved an outstanding signing but Ferguson's failure to sign a quality goalkeeper has proved to be a glaring and expensive error. Ended the Premiership season in tame fashion and against the backdrop of the Malcolm Glazer takeover controversy. VERDICT: Not good enough. Goalkeeper and midfield signings a priority. David Moyes and his players confounded the critics who tipped them for relegation by deservedly clinching a Champions League place. All this after losing Wayne Rooney at the start of the season and Thomas Gravesen in the January window. Moyes moulded a fierce team spirit and a squad that gives hope to every club not blessed with a massive budget. A spectacular success story. VERDICT: One of England's great old clubs now has a chance to go forward. A run to the Champions League final cannot put a gloss on a poor league campaign, which was characterised by dreadful away form in Rafael Benitez's first season. Liverpool were too inconsistent, although the shining light was the brilliant Jamie Carragher. Benitez has much work to do if Liverpool are to mount a serious Premiership challenge next season, even after their European adventure. VERDICT: Big changes needed or will still be also-rans next season. Sam Allardyce once again used the transfer market brilliantly to create a potent footballing cocktail. Foreign veterans such as Fernando Hierro were successfully mixed with men like Kevin Davies to inspire Bolton into the Uefa Cup for the first time. Bolton recovered from a desperate mid-season spell to invade the established order and make it another season of progress for Allardyce. VERDICT: Defied the odds to earn their rightful place in the top six. Boro qualified for the Uefa Cup on the final day of the season, so boss Steve McClaren will view it as another satisfying campaign. Mixed luck with signings and bad luck with injuries and Boro are set to spend £7m on Yakubu for next season. Difficult to see Boro invading the top four and some fans still hanker for a more exciting brand of football so, in reality, a season of solidity. VERDICT: Sound but unspectacular - but can they really move to the next level? Stuart Pearce's invigorating presence as the new manager almost catapulted a resurgent City into Europe and has sparked real optimism after he succeeded Kevin Keegan. Players clearly respect Pearce, and in Shaun Wright-Phillips City have a player of potential world-class. Will have ended the season in high spirits and much will depend on whether City can keep Wright-Phillips but Pearce is nobody's fool. VERDICT: A season going nowhere ended with spirits soaring under Pearce. Head coach Martin Jol made steady progress at Spurs after the shock departure of Jacques Santini, building a young squad that is well-equipped for the future. Disappointing end to the season that saw Spurs miss out on Europe, but there is a sense things are on the move. Expect more summer signings and the success in securing Jermain Defoe on a long-term deal is a huge statement of intent, so expect even more next term. VERDICT: Jol is a man with vision, so expect him to build on good progress. Disappointing season for David O'Leary's team, few high points and very little to get excited about. Never threatened the European placings and this will be a crucial summer for O'Leary, who says he will be given serious funds by chairman Doug Ellis. Villa are in desperate need of quality if they are not to become also-rans outside the game's top six. Crunch time for O'Leary - and, of course, Ellis. VERDICT: Very average season with few redeeeming features. A crucial summer. Charlton are well-established in the Premiership but their usual late season fade-out left a sour taste. Boss Alan Curbishley possibly raised expectations last season, but may also wonder whether he now needs to seek pastures new after stunning work. Big-money buys Dennis Rommedahl and Francis Jeffers were desperate disappointments but Curbishley still kept Charlton in a comfortable placing. VERDICT: Comfort zone once more but do Charlton now expect bigger things? Birmingham's season never quite took off, with injuries to key players Muzzy Izzet and David Dunn, plus Robbie Savage's acrimonious departure. Emile Heskey had a sound first campaign, while Walter Pandiani was a clever raid on the foreign market. But poor away form meant a push for Uefa Cup places never materialised and manager Steve Bruce may need to raid the market again to move forward. VERDICT: Disappointing after high expectations. Bruce needs more quality. Fulham will be happy with Premiership consolidation after what threatened to be a season of real struggle. Manager Chris Coleman endured a difficult second season in charge, with some heavy defeats going alongside wins like the 6-0 demolition of Norwich. Coleman believes he has learned the lessons of a tough season and Fulham will need to keep hold of players like Papa Bouba Diop to thrive next season. VERDICT: Safe but hardly a season free from worries. Improvements needed. Newcastle had a truly horrendous season - from the botched sacking of Sir Bobby Robson to the public punch-up between Kieron Dyer and Lee Bowyer. Souness picked up a poisoned chalice and yet Newcastle still reached the last four of the FA and Uefa Cups. Newcastle need massive changes in personnel this summer and Souness also needs patience from a set of fans who may just be at the end of their tether. VERDICT: Shameful season - now the real work starts for Souness. Mark Hughes was handed the responsibility of keeping Blackburn in the top flight after Graeme Souness's shock departure to Newcastle. He achieved his goal successfully, making Blackburn hard to beat - not that he should make apologies for that. Hughes also did it with much criticism ringing in his ears about Blackburn's style, especially after the FA Cup semi-final defeat against Arsenal. VERDICT: Effective, but not pretty. Hughes can now work on real progress. Pompey recovered from turmoil to end the season safe under the stewardship of new manager Alain Perrin. Harry Redknapp's resignation threw the club into confusion and Velimir Zajec proved a bizarre appointment by chairman Milan Mandaric. But Perrin has pedigree, although Pompey must regroup with Yakubu and Patrik Berger already agreeing moves and Steve Stone surprisingly released. VERDICT: Hard summer ahead for Perrin if Pompey are to stay safe next season. Defied history and the odds to survive on the final day after being bottom of the Premiership at Christmas. Bryan Robson's appointment as Gary Megson's successor was derided by some fans but he injected spirit and style into a team that was dying on its feet. Robert Earnshaw's goals were crucial and the joy of staying up will have felt like a title win in itself - and a rebirth for Robson the manager. VERDICT: A stunning recovery and now Robson must spend wisely this summer. Palace, under the shrewd guidance of Iain Dowie and fuelled by Andy Johnson's goals, almost pulled off the great act of survival. They were ultimately undone by conceding late goals and having no-one to share Johnson's burden up front. Palace chairman Simon Jordan has already insisted that Dowie and Johnson will lead the fight to return next season. And, if they stay, bank on a quick comeback. VERDICT: Great spirit, but let down by just a slight lack of quality. Norwich stuck to their principles of playing attractive football at all times and it can be argued this was what ensured they were relegated. Not an away win all season and fired up at Carrow Road just too late to escape the drop down a division. Goalkeeper Robert Green enhanced his reputation, while striker Dean Ashton proved an excellent signing from Crewe. But will they be around next season? VERDICT: Pleasing on the eye but too often a pleasant sight for opponents. Southampton paid the ultimate price for managerial upheaval, sacking Paul Sturrock after two games then replacing Steve Wigley with Harry Redknapp. It was a policy that proved fatal - as did their habit of giving away leads and conceding last-minute goals. Southampton almost acted like they wished to deliberately engineer their own downfall and, despite Peter Crouch's efforts, succeeded in style. VERDICT: What a ridiculous way to run a football club. A long road back.